I took this photo back in October of 2006. I had taken my wife to dinner for her birthday, and took this shot as we were leaving the neighborhood. I braced the camera on the edge of the fountain, turned off the flash, and got a pretty good result for a quick grab. I’ve been going through my catalog to get a set of shots ready for some B&W printing… I’ve added this one to the collection for consideration. 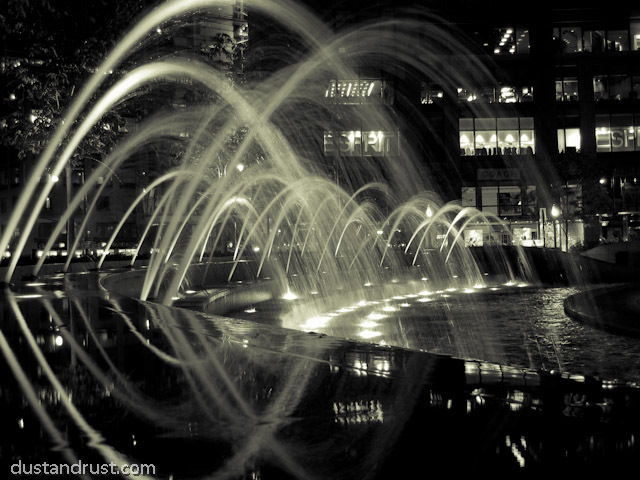 Dust and Rust – A photo blog by Sean Unruh » Looking Back – Columbus Circle Fountain at Night great article thank you. i was looking for a good pic of columbus circle2show my bf because i wld like to go c the fountains at night this is a terrific shot thanx.